As of 2019, the master Economics & Business becomes the master International Management & Sustainability. The Master in International Management and Sustainability provides you with top-notch training in Strategy and International Management for a world where sustainability challenges have become a core and not simply a side issue for business. The managers and entrepreneurs of tomorrow will naturally master important technical skills and competencies but they will also be exercising a responsible form of leadership through an in-depth integration in their thinking and practice of the sustainability challenges facing business and society in the 21st century. Building upon Sciences Po’s academic excellence as a leading Social Science University in the world, the Master in International Management & Sustainability will help you develop the analytical/critical skills required to operate in a business world where the combination of digital transformation and sustainability challenges call for a profound reinvention of strategies and business models. Weekly corporate events organized by our Placement Office, offering you the unique opportunity to network with leading multinational firms, but also with the vibrant entrepreneurial and start-up community in Paris and with a great variety of actors involved in both the sustainability and digital revolutions. 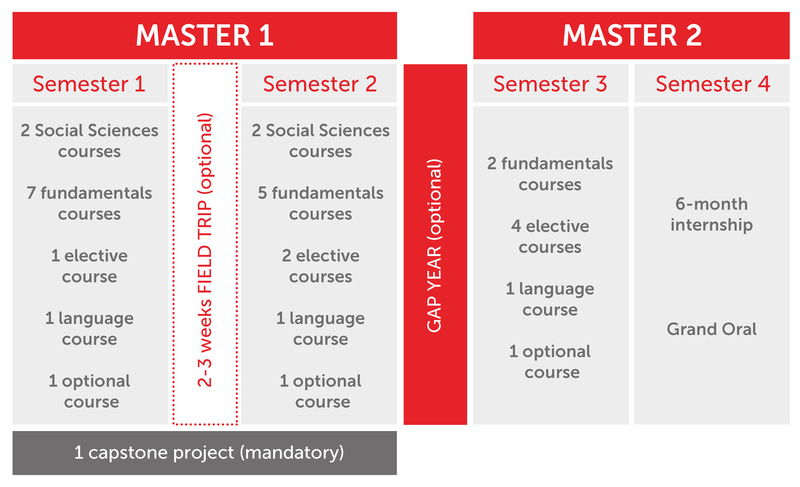 The first two semesters of studies combine compulsory courses that deliver fundamentals in management (Managerial Economics, Macroeconomics, Marketing, Corporate Strategy, Business Law, Statistics, Financial Accounting) with the necessary grounding in the sustainability challenge and its business and strategic implications (The Great Transition, Grand Challenges courses, New business models of the inclusive economy…). The third semester allows students to specialize by choosing applied and skills-oriented courses. The final semester includes a compulsory internship (14 consecutive weeks minimum, in France or abroad) and the Grand Oral, Sciences Po's final individual oral examination. A gap year consisting of professional internships in France or abroad between Master 1 and Master 2 is encouraged to fine-tune your career goals and boost your employability. Courses are taught by members of Sciences Po's permanent faculty and by adjunct professors who are leading industry specialists. The Master in International Management & Sustainability offers you the opportunity to prepare for professional certificates exams (CFA, Bloomberg, AMF), optimizing your chance of success. Graduates from this master work in a wide variety of business sectors and roles, in France and around the world. Graduates take up positions in large multinational and industrial firms, SMEs and entrepreneurial ventures, and international organizations. The programme is particularly suited for students interested in a career in consulting, finance, corporate strategy, business development , Corporate and Social Responsibility, philanthropy. Job market access is eased by leading job placements activities organized by our dynamic Placement Office: corporate breakfasts, afterwork events in companies' headquarters, job fairs, interviews preparation…. All these events guarantee first rate professional outcomes for our students: in 2016, 42% found a job before graduation! For more information on careers, read testimonials from our Alumni.